Koreans take their food seriously. Their love for morsel and all thing edibles can be seen not only through their cornucopia types of Kimchi or ‘Imagine Your Korea’ tourism campaign but also through their proverbs . 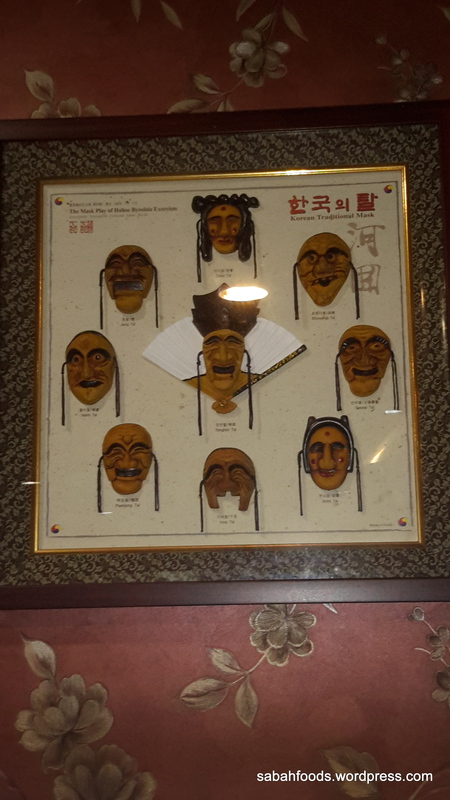 Food has become integral amongst Koreans, they even incorporate and associate their precious food with their proverbs. One worthy of note, Korean proverb that I will highlight today is “가재는 게 편이라 “, which can be directly translated as “The Crayfish sides with the crabs”. This proverb is used by the Koreans to describe how people with similar traits and backgrounds stick together and sides with each other. On a local and smaller context, this proverb describes exactly what Sabah Korea’s menu and customers to be. As of 2009, around 2000 Koreans reside in Sabah. 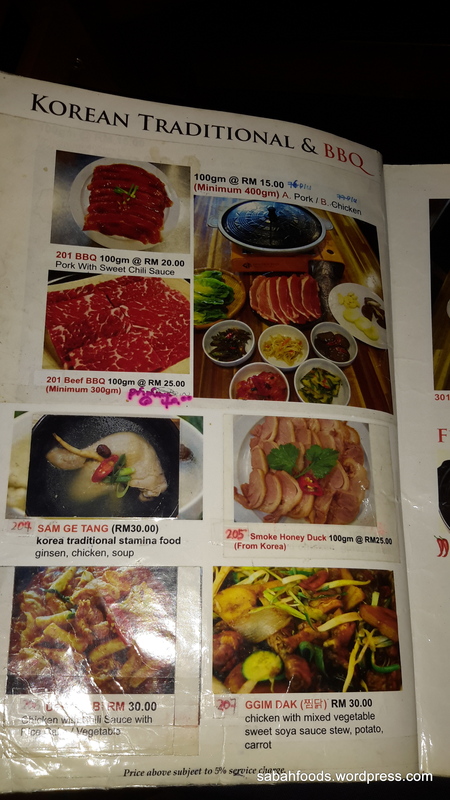 No wonder, everytime I come to this place, there will always be Korean families or couples having their ‘jjajangmyun'(Korean black bean noodles) or ‘samgyupsal'( grilled beef) .Bein on a foreign soil does not stop them from scouring for a little taste of home. It really makes me wonder, will we ever emulate their passion in local food ourselves ? With a magenta coloured walls, Sabah Korea bets on homely decor that exudes a charming setting. Customer can choose to seat either inside or outside of the restaurant. Seiza-like sitting mats are placed on all the wooden chairs, giving us options to seat comfortably, like at home. Another perks, of dining here, aside from the strong WIFI connection that allows me to Instagrammed my selfie, the place never fails to blast a’la’mode kpop songs through the stereos. I kind of have a bad premonition of bringing my sister here as she will call it tacky. I, on the other hand, beg to differ. I find it the idea of foreigners trying to tell you their roots or fragments of their hometown through their decor and music as downright romantic. The BBQs and several Korean hotpot are served in Korean pots, cockery and metal cutlery. I am really not used in using metal chopstick and thinner spoon to eat. Therefore, uncovering the wrappers of the cutlery has always been special, a kind of ecstatic moment of unwrapping presents for me. While waiting for our orders, we are served with 4 side dishes. It is a bit of a stretch but seriously, whenever I had Koreans, everytime all the side dishes being plate out to me, it never fails to make me feel like I am an empress or rich dowager. Some Korean place could serve up to 8 to dozen side dishes while you count your blessing and wait for your mains to be prepared. I enjoyed eating them all. My favourite one will be the long beans sauteed with sesame oil with sesame seeds on top of it. The equivalent of pickles, the side dishes serve its purpose to povide smell and taste that will whet your appetite for the mains. Another reason why I like Sabah Korea is because of their complimentary Kimchi and Nuts (they used peanuts instead of soybeans in making their ‘kongjorim’). 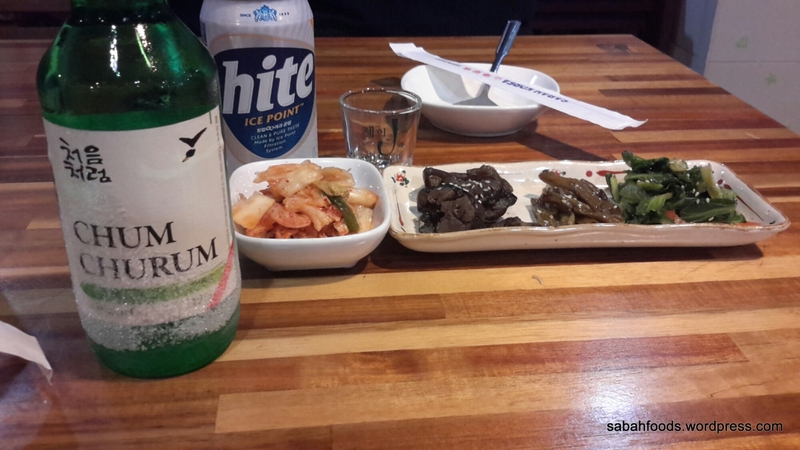 I like to chew on the improvised ‘kongjorim’ or kimchi and take a big gulp of soju or makgeolli together*. If Sabahans have ‘pusas’ to accomodate and refine the taste of their alcohol, Koreans have another healthier version of it by using lots of vegetables based side dishes. One of my personal favourite in Sabah Korea is their Kimchi. Some places like to serve their Kimchi heavy with the sauce and seasonings. Comparatively equals in fibre and vitamin C, the one that is served here is light, crispy and is well-seasoned. 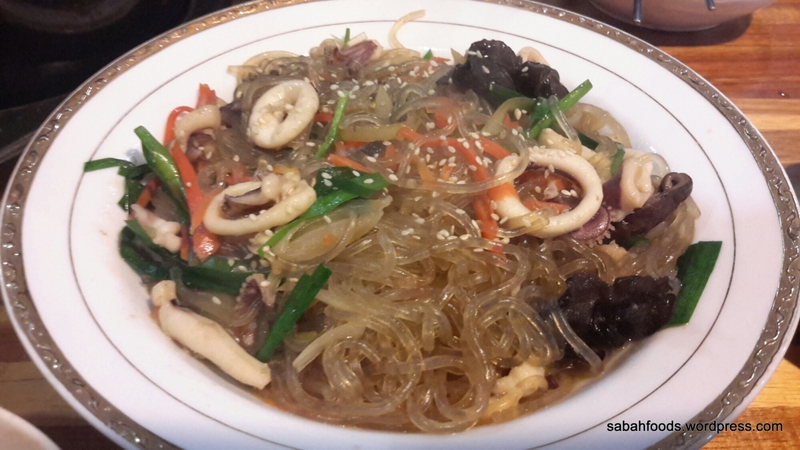 Instead of ordering ‘japchae’, I decided to add variation to my dinner, and ordered ‘Ou jing ae’. The smell of the seafood really sends me thrill. If it didn’t send thrill down your spine, I have high desire to not be friend with you. I am also an enthusiast of their Sundubu-jjigae (soft-tofu hotpot). 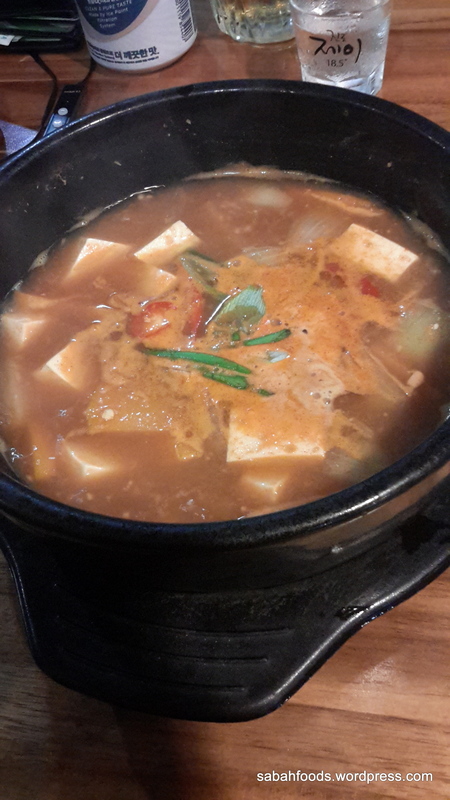 Again, just to switch it up, I have ordered Doennjang-jjigae (soybean hotpot). The picture below is self-explanatory. Even now,the glaring colour itself is enough to make me salivates like a Pavlov’s dogs. Halfway through our meal, ‘Jeyeuk-Bokkeum’ which comprise of pork slices and vegetables are served. 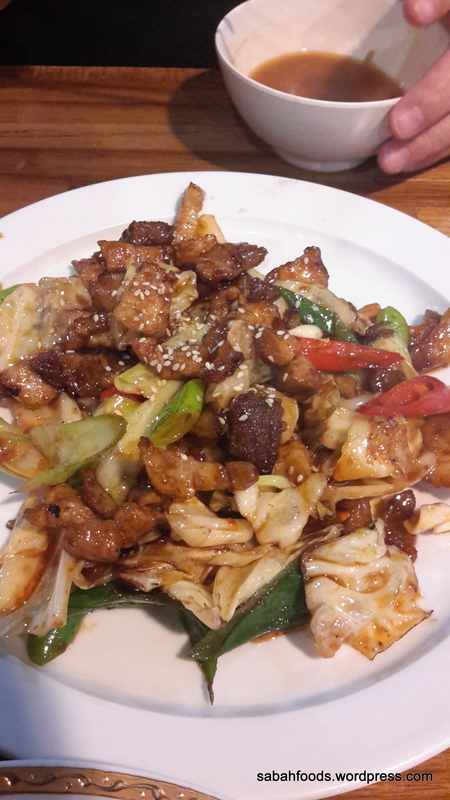 This dish featured some distinguised Korean flavours such as the basic seasonings of red pepper,cooking wine,scallions and soy sauce. This dish is so simple yet so powerful in reminding me that chronologically, traditional food has a very intense prime basic flavours. It is so intense, it literally made me and my partner in crime overeat that night. Visiting this place and watching the family running this business out of their comfort zone is always sentimental and inspiring to me. It is a great feeling to know that maybe next time an Authentic Sabahan restaurant serving traditional food (ex:’tuhau’ bambangan’) might make its way amongst the fancy Parisiene cafes because all you need is a plan, the road map, and the courage to press on your destination. 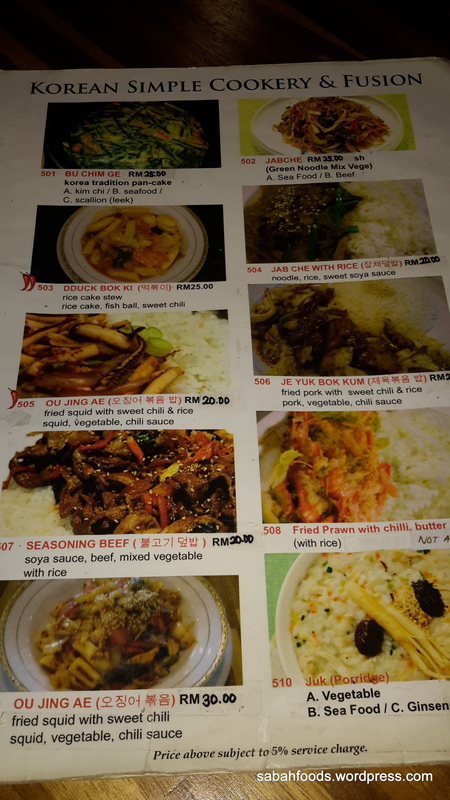 Sabah Korea serves traditional Korean cuisine, which is perfect for Koreans who misses their kimchis and sojus, as well as Sabahans, who are, well, great eater with experimental appetite. I have been to this place on several occasion, and today I recommend it if you ever passed by. Where: S – 701, 1 Borneo Hypermall, Jalan Sulaman, 88400, Kota Kinabalu, Malaysia. The restaurant is situated at the corner of the hypermall, visible from in front of the mall, first floor.